Tooth whitening, a procedure in which teeth are bleached using a whitening product (usually containing hydrogen peroxide), has become increasingly popular over the past few years. The application of hydrogen peroxide to teeth is a potentially risky procedure, which means that tooth whitening should always be carried out by a qualified and registered dental professional. The British Dental Association (BDA) has affirmed this, advising that tooth whitening is safe if it is carried out by a registered dental practitioner. 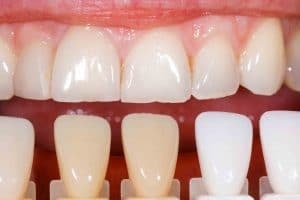 What is illegal tooth whitening? Unfortunately, as a result of the rising popularity of the procedure, there has also been a rise in the number of tooth whitening procedures carried out by unqualified individuals. Given that these individuals are unregulated, there has been a number of issues with the use of overly strong bleach (which is illegal). Tooth whitening carried out by unqualified individuals using illegal bleach is, in turn, referred to as “illegal tooth whitening”. What are the risks of illegal tooth whitening? The BBC has recorded an incident of a beautician applying hydrogen peroxide at a strength of 25%. They have also received complaints of 35% hydrogen peroxide being used by a different beautician, which caused excruciating pain, rawness and open sores. Not only is this illegal, it is extremely dangerous and can have long-lasting effects. The General Dental Council (GDC), which is an organisation which regulates dental professionals in the UK and promotes public protection, have recently prosecuted several individuals for carrying out illegal and unsafe tooth whitening procedures. Although it is reassuring that the GDC is taking action, this worrying trend shows no signs of stopping. Are you considering undergoing tooth whitening? If you are buying a “home whitening” kit, ensure that the hydrogen peroxide content is under 0.01%. Anything higher than this can cause long-term damage. Have you undergone a substandard tooth whitening procedure? If you are concerned that you have undergone a substandard and potentially illegal tooth whitening procedure, please feel free to contact us and discuss this further.